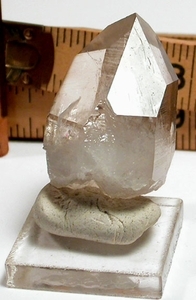 This is the natural smoky quartz hue that jewelers advertise as 'smoky topaz': clear pale taupe. A rare 9-FACED, Garland County, Arkansas natural smoky quartz. Self-displays above its' white multi-terminated base [Hera, regrowth] at 3/4x 1-1/16x 1-5/8" tall. Sharply attenuated Isis face borders a grounding channel face [uncommon 8-edged]. Many, many record keepers. Growth craters and rainbows and foils. Trivial edgewear, huge energy.